The Union County Board of Chosen Freeholders reminds residents that they can anonymously turn in unwanted guns in their possession at either of two locations on Saturday, October 27, from 9:00 a.m. to 5:00 p.m. The two locations are the Macedonia Baptist Church at 1251 Fairmount Avenue in Elizabeth and the Visions of God Family Worship Church at 350 Leland Avenue in Plainfield. Residents can turn in up to three firearms and receive up to $250 for each weapon. 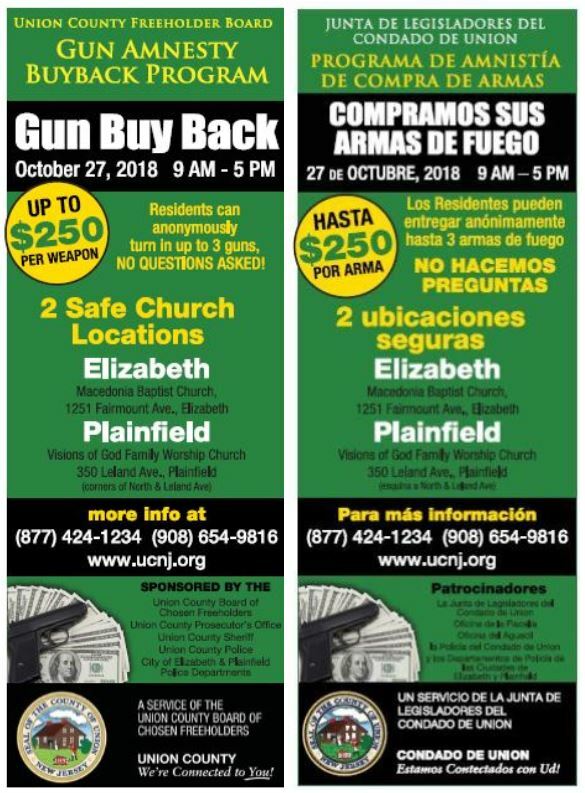 “These buyback events offer our residents a secure way to remove unwanted weapons from their possession and ensure they don’t fall into the wrong hands,” said Freeholder Chairman Sergio Granados. Gun buybacks are designed as an opportunity for anyone to turn in any gun, in any condition, with no questions asked. For questions about the buyback event, call the Union County Department of Public Safety at 908-654-9816 or the Public Info Line, 877-424-1234.